creativity. You can see it bigger by clicking on the image. Happy day with lots of creativity! You are quite the artist and i always look forward to your next post...can't wait to see what you have come up with next!!!! I love you doodling in my sketchbook to clear my mind. Your sketches are darling! Have a great weekend! I love your sketchbook lots! 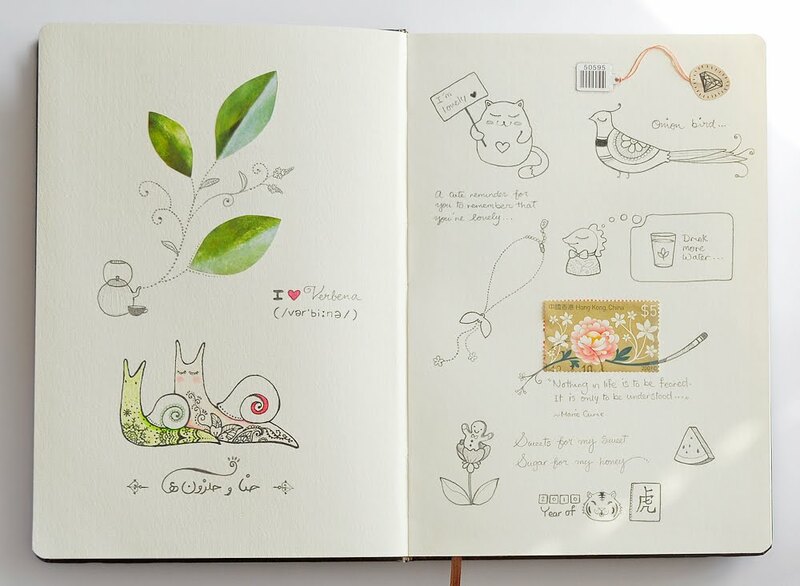 It's filled with such gorgeous doodling! Oh wow you even wrote the word tiger in mandrine in such loveliness! Have a lovely merry happy weekend and love to you! Super Cute! I love new blank books just waiting for you to fill them up with stuff. Awww! I wish my sketchbook looked as wonderful as yours. Adorableness! Are these beautiful verbena leaves watercolour? Thanks a lot Mux! xoxo Those leaves are pieces of magazine that I cut and collaged into my sketch book!